After a post-high school trip to Nepal Maggie Doyne asked her parents to send her life savings, which she used to found The Kopila Valley Children’s Home in 2006. Four years later, she is the legal guardian for 30 orphans and just completed building a school for them. 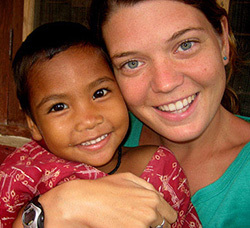 Maggie Doyne left on a post-high school trip to Nepal and never came back. After seeing the way kids–many orphans–were living, she called her parents and asked them to send over her life savings, with that money she founded The Kopila Valley Children’s Home in 2006. Four years later, she is the legal guardian for 30 orphans and just completed building a school for them. Doyne, now 24, talked to Fast Company about her remarkable journey, starting as a girl in Mendham New Jersey and ending up a leader for social change in rural Surkhet, Nepal. To create a safe home and school for orphaned and abandoned children in a poverty stricken region of Nepal. I met children in need of a home and decided to build one for them. I wanted it to be the kind of home and the kind of childhood that I thought every child in the world deserved. It was really as simple as that. I truly believe that if every child in the world is provided with their most basic needs and rights–a safe home, medical care, an education, and love, they will grow to be leaders and end cycles of poverty and violence in our world. What problem or issue did you first try to answer? Mainly homelessness and children not having the opportunity to go to school, be educated and survive on their own. What was your initial goal in addressing that problem? Enroll children into school and give them a safe home and childhood so that they could grow to be future leaders for their country and generation. What was the first milestone reached when you knew this was going to work? Seeing the brick walls going up and realizing that the building was no longer a blue print on a piece of paper, but suddenly a living breathing structure with children running around. My mom was originally a nurse practitioner and mostly ran her own consulting business while I was growing up providing for our family. I had the world’s greatest stay at home dad. My parents were both very present during my childhood. I’m a lucky girl. Although I initially intended to go to college I ended up taking a Gap Year after high school to take a breather, step out of the classroom and do some travel through service. It was one of the best decision I’ve ever made and eventually led me to a backpacking trip to Nepal, which eventually led me to start an NGO here. How did your goals change over time? My goal is pretty much the same today although it’s grown and expanded a bit to reach more people in our village and community. We’re launching a school and community center this year. What figures do you most admire, whose leadership do you follow and whom do you seek for advice? I have a very close group of adults, advisors, friends all of whom I go to depending on what the issues is or what kind of advice I’m seeking. I’ve been blessed to have some really incredible teachers and mentors in my life. I also realized very early on that the people of Nepal had just as much to teach me as I had to teach them. I think that one of the reasons for this project’s success is the fact that from the very beginning, our local community here in Nepal has been here backing me 100%. I made it a priority to set up a separate Nepali Board of Directors made up entirely of people from Surkhet. The women on the Nepali Board are mothers, shopkeepers, and community leaders, they cannot read, they cannot write, none of them have been afforded an even elementary school education, but they are among the wisest, brightest, most amazing women I have ever had the privilege of working beside. I learn from them every day. How is your life different now than it was before you started? Sometimes I feel like I’m living in a parallel universe on another planet. My life has taken a completely different turn (8,000 miles in a different direction to be exact), and I never could have ever imagined any of this when I was a teenager living in New Jersey. That’s the neat thing about life I guess, you never can really know where you’re headed. I’m so pumped about our generation. I think we’ve got all the tools we need at our fingertips to change the world for the better. Now it’s just a matter of doing it and I think we’re well on our way. For the past few months it’s been getting our first very own school up and running steering through the paperwork, administrative and land dealings. How has technology, social media affected your work? My blog has been a wonderful way to both share our day-to-day life here in Nepal and to connect with amazing people from all over the world who support and encourage the work we do. Visitors can come to the site and literally read about what the kids ate for breakfast that day, what the daily challenges are, and see our triumphs and progress. What assets or challenges do you have because you are young? I think the fact that I’m young has actually been one of my greatest blessings. I appreciate the fact that my age, and the age I started this project (19), has brought a sparklingly positive perspective that I know has helped me overcome potential roadblocks or barriers. Some may call it naiveté, but I am grateful for my ceaseless “anything-is-possible-nothing-can-stop-me” mindset! I’ve never doubted myself and I’ve never feared failure. I keep dreaming and visualizing. I’m proud to be a young social entrepreneur representing my generation. I believe in the goodness of this world and know that we all have the power to change things, to make a difference. I’m constantly in touch with other young people with similar goals and dreams. This keeps me hopeful about the future. Every child would have a home, enough food in their belly, and a chance to go to primary school. Even though I can’t personally do something for every single child in the world struggling to survive. I focus every day the sanctity of our home and making sure that my children feel safe and loved. I’ve noticed that the peace in our home and the joy of our children often radiates to our neighbors and our village, the city we live in and people who come to visit from other countries in the world. We all know that children are the future. When our world’s children are educated, when they’re given childhoods, and love and a home, and enough food to eat, they grow up to share that with others and create peaceful homes of their own. The model for our home works because it is just that: a home with family living in it who love each other very, very much. When I feel overwhelmed with the big picture of the world or the political situation in Nepal or the extreme poverty I see around me, I stop and try to focus on the smaller things that I know are in my control: bathing my children, trimming their fingernails, cooking a meal together, and reading a bedtime story. Then my heart feels peaceful again and then I can keep going. If you had 60 seconds with President Obama what would you tell or ask him? I’m sure President Obama and everyone else in the world for that matter shares similar dreams and wishes about the current state of our world’s children. I’d probably share my hopes and dreams for the world with him.